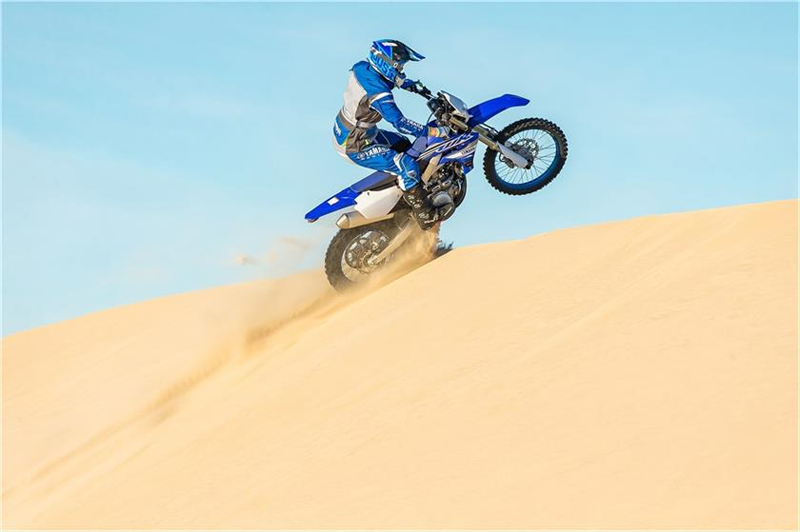 This off-road bike offers enhanced performance to make this aggressive trail machine much closer to its YZ and FX brothers. YZ450F™-DERIVED BILATERAL BEAM FRAME: Yamaha’s refined aluminum frame provides rigidity and durability, with frame spars and engine mounts developed alongside the YZ450FX cross-country racer to centralize mass for the best possible balance of bump absorption, stiffness and rider feeling. 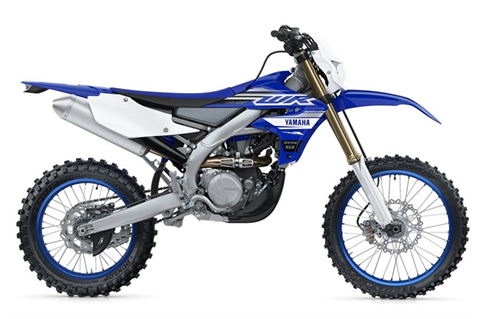 COMPACT BODY AND SEAT DESIGN: The WR450F features stylish bodywork from tip to tail, including a large 2.15 gallon, mass-centralized fuel tank shared with the YZ450FX™. The body design is narrow for more comfortable knee grip and control feeling while the narrower seat gives the rider additional room to move aboard the machine. Even the rear fender is specially designed for added rigidity to make moving the machine easier. 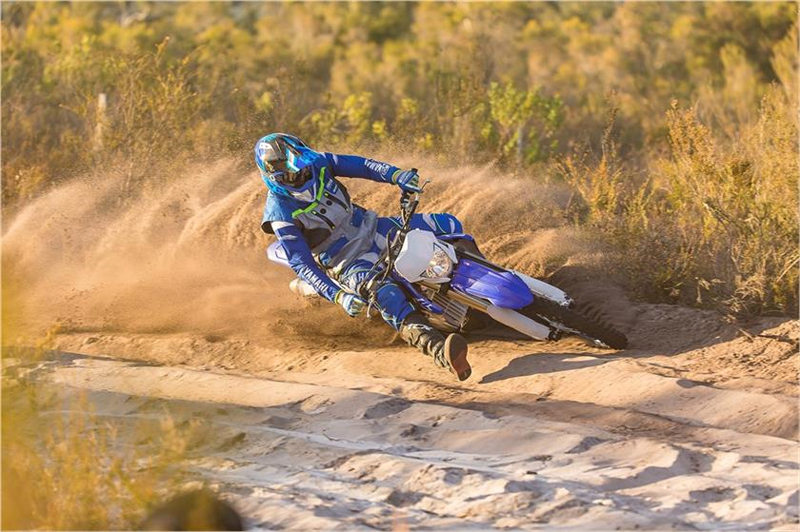 CLASS-LEADING SUSPENSION: The WR450F’s industry-leading, fully adjustable KYB® coil spring-type fork with speed sensitive damping provides exceptional balance between handling and bump absorption, with updated mid-speed valving for improved feel at slower fork speeds. The linkage type rear suspension features a KYB® shock features a coil spring for lighter weight without sacrificing durability as well as a larger oil reservoir for more consistent damping. 270MM FRONT BRAKE: Large 270mm front disc brake coupled with aggressive pad material offers outstanding braking performance and machine control, with exceptional stopping power and controllability. 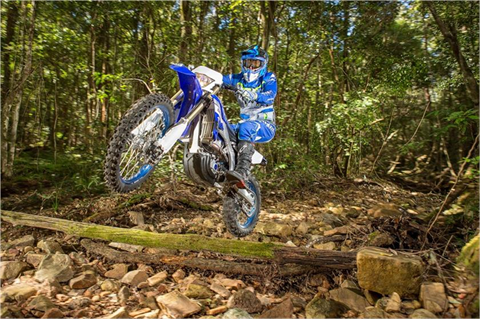 CROSS-COUNTRY WHEELS AND TIRES: The WR450F features enduro-specific Dunlop® tires for the ideal balance of traction and durability, complete with an 18-inch rear wheel. Each wheel’s cross-sectional profile is computer-designed to shave valuable weight without sacrificing durability, too. 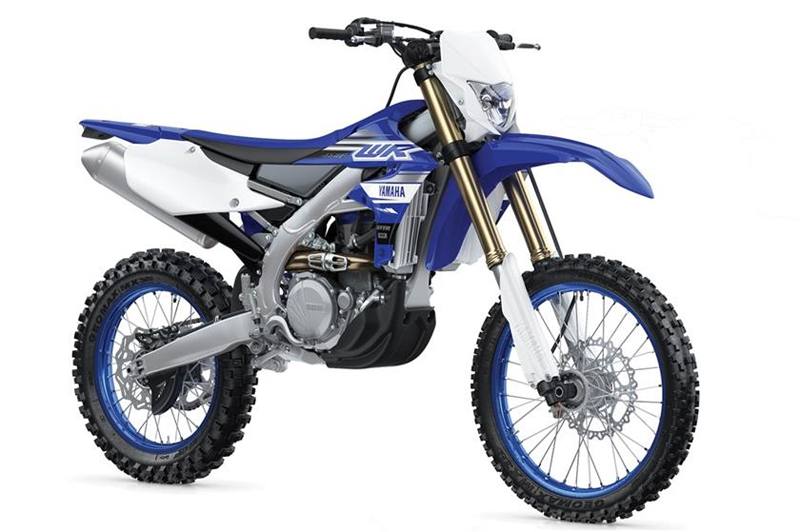 REARWARD-SLANTED CYLINDER DESIGN: The WR450F’s distinct rearward-slanted cylinder design—complete with rear exhaust and forward-mounted intake system—features a cylinder head that works with the frame geometry for optimized weight distribution. Inside, the engine features a straight intake tract, aggressive cam profiles, high-compression “box bridge” piston design with DLC-coated piston pin, and more. 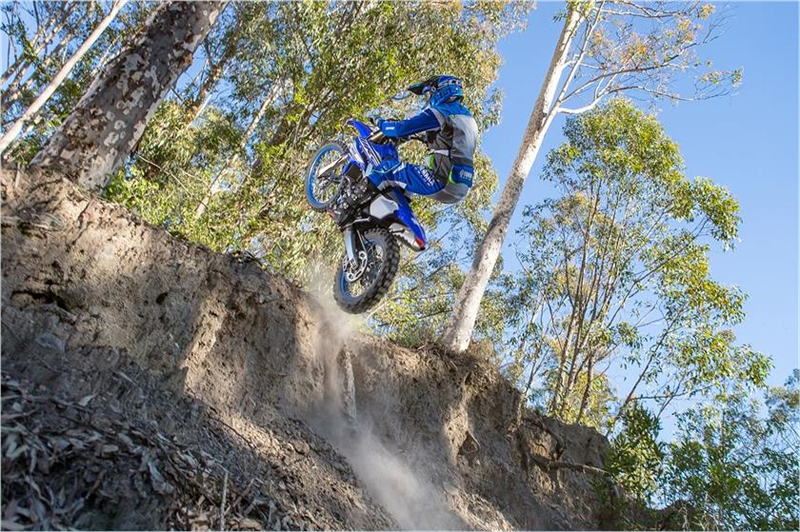 UNIQUE ENDURO ENGINE TUNING: WR450F-specfic ignition and fuel injection maps are optimized for enduro riding and racing, for exceptionally smooth and controllable midrange power with longer-lasting pulling power in the top-end. ENHANCED INTAKE AND EXHAUST SYSTEMSThe WR450F features two-piece air filter with improved sealing that works in conjunction with the tuned intake tract length and WR-specific muffler to boost the linear feeling of traction and drive. HIGH-CAPACITY RADIATOR: The WR450F uses a large radiator with excellent cooling capacity shared with the YZ450F motocrosser, complete with a cooling fan for consistent performance during the toughest enduro rides. 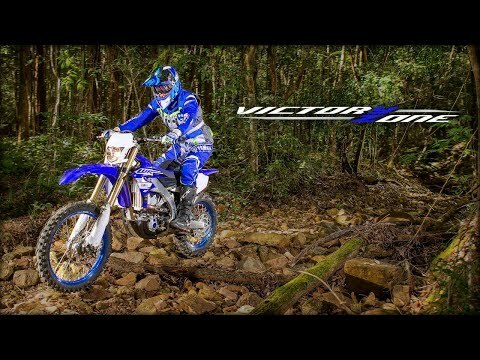 ELECTRIC STARTER SYSTEM: The WR450F features a compact electric starter system to simplify restarts on the trail and add convenience everywhere else. ADVANCED FUEL INJECTION: The engine breathes through a 44mm Mikuni® throttle body fed by a high pressure electric pump to ensure optimum fuel atomization and power for a wide range of riding conditions. 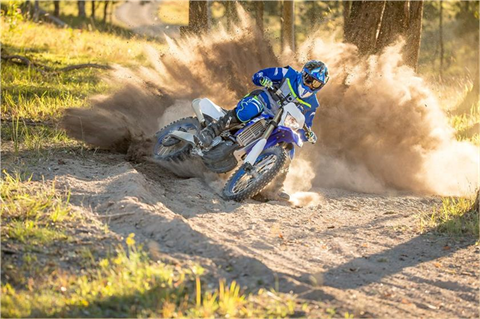 ROBUST TRANSMISSION AND CLUTCH: The 2019 WR450F’s wide-ratio 5-speed transmission is shared with the YZ450FX and enhances cross-country performance for more flexible gearing selection in open terrain. 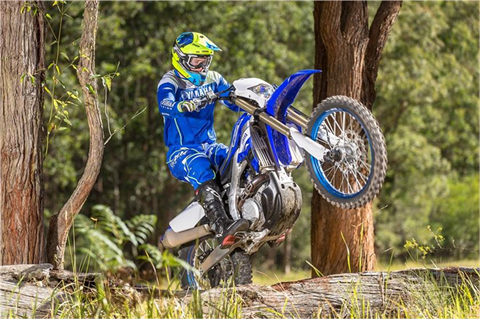 The clutch system has also been reworked especially for the WR450F for improved heat dissipation and lighter clutch lever effort. HIGH-SPEC ENDURO: For 2019, the WR450F takes all the latest advancements found on the YZ450F and builds upon them to create the ultimate trail-ready enduro machine, with engine and chassis tuning optimized for accessible power, handling balance, and flexibility on every trail. 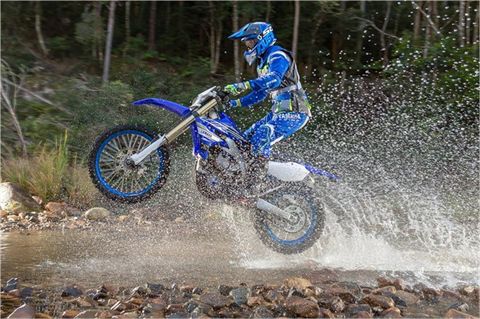 ENDURO-READY DETAILING: The WR450F includes a range of enduro-specific upgrades compared to the YZ450F motocrosser, including a wide, full-coverage composite engine guard, sealed O-ring chain, fuel level warning indicator and a folding aluminum kickstand that is mounted higher than before for improved ground clearance. COMPACT HEADLIGHT UNIT: The 2019 WR450F utilizes a headlight unit and fairing that centralizes mass and improves the light and agile styling of the machine. ULTIMATE ENDURO MACHINE: For 2019, the WR450F™ builds on Yamaha’s exceptional motocross and cross-country race platform with added features and unique settings designed to optimize the WR® for enduro riding. 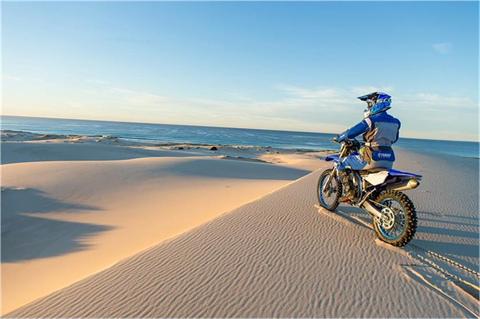 ELECTRIC STARTER SYSTEM: Utilizing a compact starter motor system battery, the WR450F maintains the convenience of push-button starting, for effortless restarts and relaxed riding when the clock isn’t ticking. 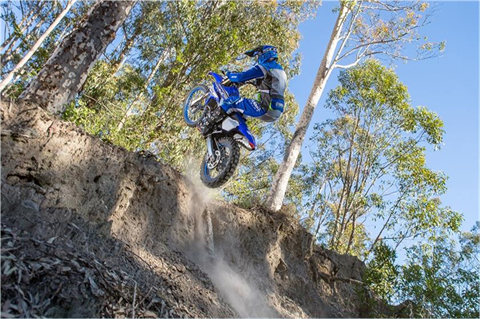 POTENT FUEL-INJECTED ENGINE: A high-compression cylinder head, forged piston, aggressive cam profiles, cylinder geometry and much more work together to give WR450F riders a broad spread of useable thrust with expanded high-rpm power. 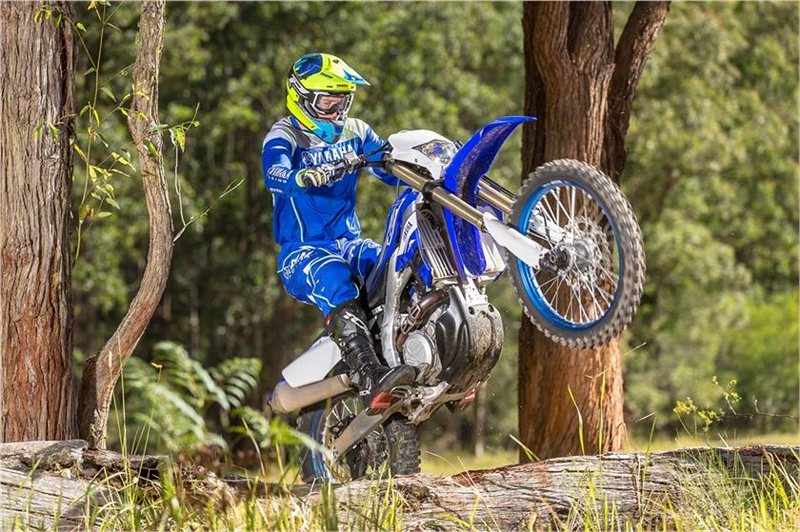 ADVANCED ALLOY FRAME: Yamaha’s bilateral beam aluminum frame is derived straight from the YZ450F to centralize mass and provide an ideal balance between cornering feel and straight-line confidence. 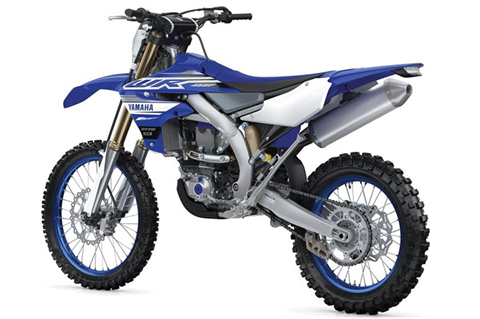 CLASS-LEADING SUSPENSION: Yamaha uses KYB® spring-type forks of the WR450F, with industry leading function and easy tuneability for a wide range of conditions.